January 20, 2010 - MPB Communications Inc. is pleased to announce the recent awarding of a contract from the Canadian Space Agency to develop a Smart Reconfigurable All Terrain Multi-Mission Microrover. This marks the sixth contract received this fall, and the first involving the building of a system prototype. Named KAPVIK after the Canadian Wolverine, the microrover will be based on modular architecture to allow optimal reconfiguration for Moon and Mars exploration and science. It will also include a modular arm and a suit of miniature spectroscopic sensors. Kapvik will employ a number of Canadian innovations in robotics, sensors, microsats and real-time intelligent software to enable high functionality within its 30 kg mass budget – the average weight of a 9-year old child. The robotic mast with end effector will enable acquisition of selected samples and subsurface trenching. Multispectral imaging UV-Vis/IR sensors will provide in situ analysis and 2-D mapping of mineralogy, water/ice content and planetary resources. 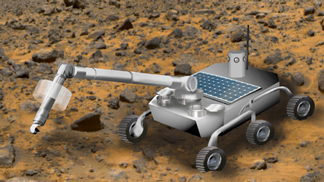 Kapvik will operate independently for low-cost planetary exploration, or as a collaborative assistant to benefit manned and large rover missions. Artists’ conceptual drawing of what Kapvik may look like. The modular arm with end effector will enable acquisition of selected samples and subsurface trenching. MPBC will lead a developmental team that includes Carleton University, Ryerson University, the University of Toronto, the University of Winnipeg, Xiphos Technologies Inc., and MDA. The kick-off meeting was held on December 11th at MPBC headquarters in Montreal. “We’re really excited about getting into this project. It will allow us to expand our expertise into the space system development and at the same time to demonstrate the capability of our miniaturized photonics devices" said Dr. Wes R. Jamroz, Director of Space Photonics Devices Division at MPB Communications Inc. The prototype will be tested during an analog mission at a selected site near Montreal. MPB Technologies Inc. was founded in 1977, and develops high technology materials, products and systems in the fields of telecommunications, robotics, space and photonics.